Branding is the sweet spot of selling online and for many global brands their execution is flawless. But it’s time that retailers and brands realize merchandising is integral to their success. Whether it be curating the assortment, guiding the shoppers through selling tactics or smartly integrating merchandising assets throughout the shopper journey, all play a pivotal role. To understand how brands are evolving to stay ahead in this new market, Astound Commerce Insights evaluated the desktop, mobile, and in-store experiences of 50 global brand retailers in our 2017 Global Mystery Shopping Study. We measured the branding, customer experience and services delivered through 206 metrics across eight common shopping scenarios, including site browsing, product search, customer service access and queries, and visiting Chicagoland physical stores when available. At the time of this analysis, I’d also been helping an apparel brand assess their performance levels. Upon first glance, I was impressed with the site experience. But as I dug deeper into that site, I realized that there was very limited merchandising. Of course, they had some promotions to ensure parity with their retail partners, but they did little to merchandise the shopping experience. The issue was not a lack desire to merchandise but a lack of resources and talent within the organization to guide those efforts. The role of merchandising has often taken a back seat to other organizational functions. In the interest of simplicity, I’d like to suggest 2 reasons why merchandising matters. Shoppers have abundant choice around which products to buy and where to purchase from, so it is essential that brands inspire them. This means leveraging merchandising. Introduce tactics that showcase what’s new and customer favorites while continuing to introduce seasonal themes that remind shoppers why they should make a purchase. According to our recent report, global brands have not adopted the best in onsite merchandising. Merchandising is in place but limited in its execution. For 86% of global brands, the all-important “what’s new” is used. This feature drives purchase frequency and reinforces the dynamic assortment. Themes and seasonal areas are also utilized by a majority of brands, with 4 in 10 testing top sellers. The remaining tactics are used sporadically. One in five global brands use loyalty programs and understand retention plays a role in revenue generation. Content plays an important role in educating and converting customers. 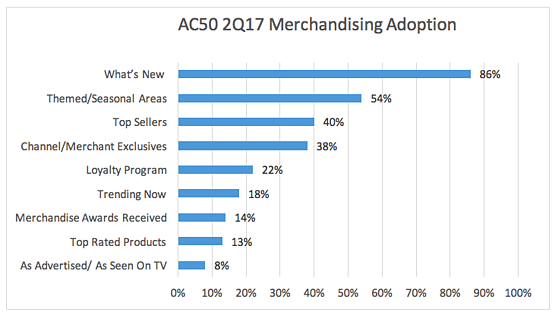 One in 3 shoppers finding sizing, product finders and customer tools very important according to our Astound Commerce Insight’s “Global Brand Shopper. Guiding shoppers to make the right choices comes in a multitude of formats. Video’s role is to educate as was seen in home (63%) and technology (60%) vs. a 48% study average. How-to guides see “most favorite” status via health and beauty (100%) and home (50%) as compared to a 34% average. Successful merchandising means selecting, executing, and integrating the right tactics. The shopper journey is filled with opportunities to suggest appropriate merchandising rather than keeping products in silo and limiting potential visibility. With such an approach, visitors are more likely to encounter the merchandising when they are in the buying mode. Shoppers must be guided to the right products in context. When merchants do the necessary planning to best position their assortment, adding merchandising to search results, category pages and as part of the product page decision-making juncture, increased chances of conversion are the likely outcome of those efforts. Examples of such integration include product finders. In the beauty category, product finders can help shoppers select the right foundation or moisturizer. In consumer electronics, a much different model, finders help shoppers select the right computer type - guiding visitors to a laptop or desktop based on a set of pre-defined criteria. Featuring such functionality on category pages makes for timely exposure and expedient decision-making. Ratings and reviews captured the hearts and minds of online shoppers over a decade ago. Integrating such content on the product detail page, as part of search results and positioning the voice of the shopper via top rated and customer favorites tools, gives sellers much greater credibility in the buyer’s mind. This peer-generated content resonates more with potential buyers than the information merchants typically shared, though it still has a role to play. Brands must begin by honestly reflecting on their own merchandising skills and sophistication. Once that evaluation is complete, a roadmap and internal prioritization is a mandate to move the merchandising needle. I encourage you to read our new report: Twists, Turns and Takeaways. It is replete with best practice examples along with insightful commentary that brings the research findings to life.